Many folk ask why I didn’t use masking fluid in a demonstration painting where I needed to reserve white areas, and this is a constant source of concern to artists. Often the decision depends on how you feel about the use of the fluid, and in my case I normally only use it when there are intricate details in white, or a light tone. In this detail of a watercolour of the old harbour at Fishguard I made quite extensive use of masking fluid on the roofs and chimneys, the clothesline, steps and white highlights on the water. 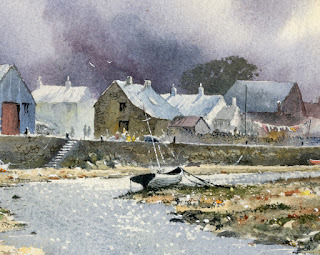 This allowed me to brush the sky wash vigorously across the paper and over the tops of the roofs, and later to apply the dark washes over the harbour wall and steps and the background to the clothesline without having to fiddle. The same applied to the sparkling water where I used cobalt blue. I sometimes work round these features to create the negative shapes, but this can make the background appear overworked or splotchy, and take away the freshness. However, developing your skills at negative painting is invaluable, and is an excellent alternative to masking fluid. You will notice in this painting that there are tiny white features such as gulls, masts and ropes hanging from the harbour wall. These were rendered with white gouache, as I prefer this where the feature is so thin that masking fluid can appear clumsy. Gouache is also really effective for tidying up bits that haven’t quite worked. This entry was posted in atmosphere, David Bellamy, Gouache, Masking Fluid, Negative painting and tagged negative painting, Patchings Art Festival, St Cuthberts Mill by David Bellamy. Bookmark the permalink. Wishing you and Jenny all the best for Christmas and 2017. Hope to catch up with you both at Patchings in July. Thank you for your continued inspiring tips and I wish you and your family a wonderful festive holiday. Thank you for your lovely blog as it is so relevant to my painting. Sometimes masking fluid is a disaster and I swear to never use it again but your advice is invaluable and so useful as you reminded me why and how to use it properly as your stunning painting shows. I absolutely love the way you carefully and sparingly use white gouache to great effect … wonderful ! I too enjoy negative painting when I ‘flower paint’ but rarely use masking fluid then as I prefer a softer approach ? I envy your lovely location to escape into the wild in winter to paint, so I shall imagine you there over the festive season. What a lovely contrast from the busy times with Christmas and family and the great outdoors. Happy painting and a very Merry Christmas to you, Jenny and your family. Thank you both for the inspiration you have given. You have enriched my life more than you will ever know.